Tonbridge Castle is one of the best examples in England of a medieval castle-type house with a portal, surrounded by a protective mound and ditch. Tonbridge is situated on the north bank of the River Medway, which in medieval times played the role of a natural protection for the fortress. This is one of the most interesting defenses, within the English county of Kent. Tonbridge Castle is an extremely well preserved original portal, consisting of two massive round towers. 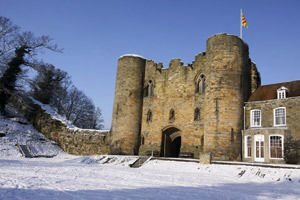 Today the castle and the beautiful park around it has been turned into a tourist attraction and inside Tonbridge, audio tours are offered in English, French, Dutch and German. The architecture of Tonbridge is not only what the visitors today go to see. The ancient history of the fortress is associated with that of kings and archbishops, tyrants and heroes, murderers and mercenaries who have over centuries lived outside and beyond these massive stone walls and thus contribute to write 900 years of English history. The original wooden medieval castle Tonbridge was burned to the ground in 1088. However, in the 13th century Tonbridge undergoes re-restoration. The portal with its two massive towers also appears in the 13th century and was built during the sixth Earl of Hertfort - Richard de Clare and his son - Gilbert. The construction of this structure takes 30 years and was completed in 1260. However, the historical importance of the castle Tonbridge ends somewhere in the 14th century. From there it was only in 1950 that talk began about the restoration of the palace, and then formally Tonbridge opened for public visits in 1992. Today, visitors to the mansion are able to enjoy the completely free 14-acre gardens of Tonbridge. Against a small entry fee you can go inside the castle and explore interesting spaces like the warehouses with expensive spices, armory and its carefully preserved artifacts and more.